I was searching for funny things to write about. Usually this involves Housewives, Alaskans, or Kardashians due to the unlimited material. How lucky was I that a “Housewife” came to me…. After logging into Twitter I spied a few new Notifications. One of them was from #RHOC “star” Shannon Beador. Shannon sent this message to me Sunday 7/5/15 at 11:00pm California time. We both live on the Westcoast so it’s a tad late for anyone to be up. Shannon has famously stated how she goes to bed at 8pm with husband David because they are “making things work.” I replied to Shannon’s text this morning at 9am. According to Mrs.Beador asking her a question makes me nasty?? Or is sober Shannon not a morning person?? Anything Else???? I can hear her sarcasm through the laptop and wasn’t amused. Yes there is something else. I’m insane because I think I know you Shannon? You explode on me like you do to others on RHOC, so maybe I do have a handle on the real Shannon Beador! How about calling yourself insane for taking your marital troubles and putting them on television? You call me cruel? What’s cruel is having teenage daughters mocked at school for Mom and Dad’s dirty laundry. Nobody’s marriage has ever been saved on Bravo’s version of Reality Television. By the way you acted on tonight’s #RHOC when David said,”Beach Girl” yours isn’t as great as you keep insisting. 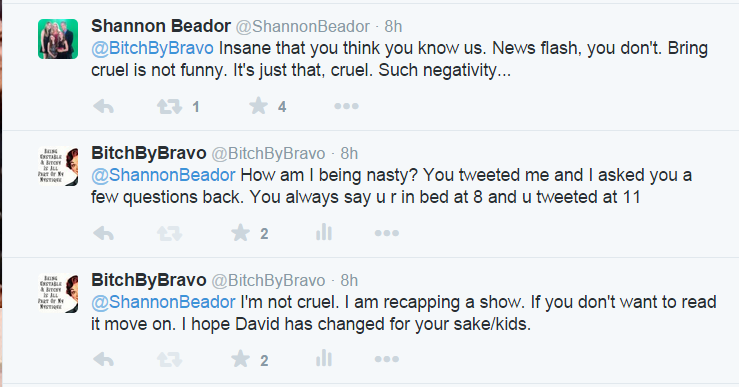 Work on yourself Shannon and quit giving David a pass. After this scenario and the horrible way BravoTV handled the death of Vicki’s mother I’m done spending time with the #RHOC. If I wanted to be depressed this show would fit the bill! Shannon will never understand. She is too busy always being right and fighting to the death why she is right. She STARTS charities, after all! She will feng shui and supplement and crystal away what she doesn’t want to see or hear. To be around that whiny, victim, wet blanket would make most husbands jump off a cliff. Poor David, he just wants some levity, some one fun. He’s pretty hot and Shannon is becoming a paranoid, nagging drag.